The present Village of Wilmette is distinct among North Shore communities because it was created by the 1924 merger of two older villages, Wilmette and Gross Point. The origins and development of these two communities differ, and this difference is still visible on the landscape. On the east, Wilmette developed on a wooded tract bordering Lake Michigan. On the west, Gross Point was the center of a German immigrant, farming community that spread across the open fields west of what is now Ridge Road. Among the first residents of Chicago was a French-Canadian fur trader named Antoine Ouilmette. 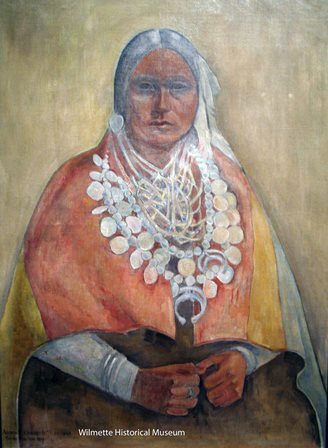 His wife, Archange, was the daughter of a French trader and a Potawatomi woman. In 1829 in the Treaty of Prairie du Chien Archange Ouilmette was granted 1,280 acres in what is today Wilmette. The grant, thereafter known as the Ouilmette Reservation, occupied a wooded tract adjacent to Lake Michigan and was bounded by what is presently 15th Street, Elmwood Avenue, and Central Street in Evanston. The Ouilmette family lived in a log cabin near the present site of the Michigan Shores Club until 1838 when they moved west to Iowa with the Potawatomi. Their land was sold in the 1840s to new people moving into the area. 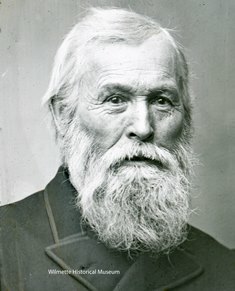 Beginning in the 1840s, at about the time the Ouilmette family moved from their lakefront cabin to Iowa, immigrants from the area of Trier, Germany, established a farming and business community west of Ridge Road. They called their community Gross Point, probably named after the point of land that juts out into Lake Michigan at the lighthouse. The life of the community centered around St. Joseph Church and School which was established in 1843. The first church building was a log cabin. A new stone church was built in 1869, and the current school and church buildings were completed in the 1930s. In 1874, the Village of Gross Point was incorporated with a population of approximately 300 people. The boundaries of the new community were Ridge Road on the east, Locust Road on the west, Winnetka Avenue on the north and Central Street in Evanston on the south. The Gross Point Village Hall, which now houses the Wilmette Historical Museum, was built in 1896. 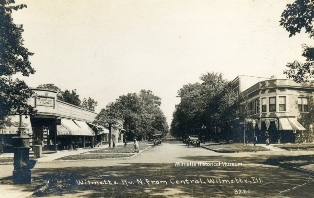 Wilmette's road to incorporation began in 1869 when a group of five men formed a land syndicate to promote residential development on the former Ouilmette Reservation. John G. Westerfield (right), the man who had originally farmed the land around the old Ouilmette cabin and later the village's first president, laid out streets and lots in his first survey of the village. Despite this earlier platting of the Village, it was not until 1872 that the village was incorporated. It was named after early settlers Archange and Antoine Ouilmette, although the spelling was changed. The railroads played a crucial role during this early period of development. 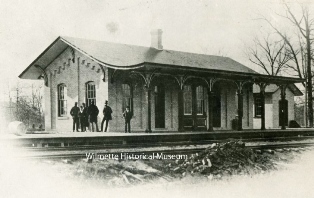 In the 1860s the Chicago and North Western Railroad agreed to establish a stop in Wilmette at Green Bay Road and Wilmette Avenue. Commuter train service to Chicago began in 1871. In 1894 the Chicago Milwaukee and St. Paul Railroad extended a line through Evanston to a terminus at 3rd and Maple Streets in an area called Llewellyn Park. Five years later, the Chicago & Milwaukee Electric Railway Company extended its line south from Waukegan (running east of the C & NW tracks and proceeding east on Greenleaf Avenue) and connected it with the Chicago Milwaukee and St. Paul's lines at Llewellyn Park. The Electric Railway line was commonly known as the North Shore Line. In 1910, the Northwestern Elevated Electric Railroad replaced the CM & St. Paul line, making electric train service to Chicago or Milwaukee available for the first time from the east side of the village. This line was expanded north to 4th Street and Linden Avenue in 1912. In 1913, the railroad's architect designed and built a Prairie-style station intended to be a "high-grade artistic terminal to attract the better purchasers." This electric line is commonly called the "L" line and still operates. 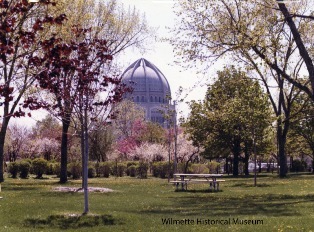 By the 1920s, most of the characteristic land use features of Wilmette were established. A business district extended two blocks east and west of the Chicago & North Western Railroad depot along West Railroad Avenue (Green Bay Road). 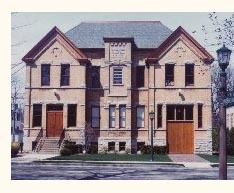 A Carnegie Free Library (built in 1905) stood at Wilmette and Park Avenues and a Village Hall stood at the corner of Wilmette Avenue and Central Avenue. Several churches and schools already occupied their present sites. Residential development was extending east with many large residences designed by distinguished local architects. Subdivisions of more modest homes were built west toward Ridge Road. The brick-paved streets were bordered with tree-lined parkways. On the lake shore, two major engineering projects were underway. The first project, the North Shore Channel, was constructed by the Chicago Sanitary District from 1908-1910 to control the flow of sewage from the Chicago River to the lake. Clay excavated from the channel was deposited nearby as landfill which became Washington (later Gillson) Park. To administer this public land, the Park Board was established in 1908. The second major engineering project was the construction of Sheridan Road to replace the old Green Bay Trail. 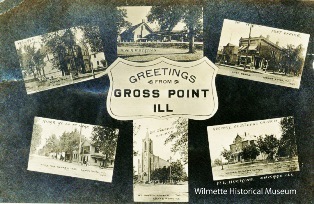 At the same time, Gross Point's population was growing, although in less dramatic fashion than Wilmette's because the community retained a farming focus. The population increased from 327 in 1880 to 669 in 1900, and by the time of its last census figure in 1910, had reached 1,008 residents. In April of 1919, with its neighbor to the east a burgeoning suburb and the passage of the Prohibition (18th) Amendment threatening Gross Point's many saloons and economic prosperity, the Gross Point citizens voted to dissolve their municipal government. It was not until 1923, the year the Gross Point Village Hall was finally sold to pay village debts, that the first steps toward dissolution were taken, however. Some residents organized a last-ditch effort to save the village through a referendum in January 1924, but the attempt was voted down in a special election and the process of annexation to Wilmette moved ahead. In two annexations in 1924 and 1926, Gross Point was annexed to Wilmette. Development started immediately in the newly annexed land including the 170-acre development known as The Indian Hill Estates by Bills Realty, Inc. Promoted as an "ideal community," the subdivision was laid out by architect Philip Maher with winding roads. Additionally, a brief surge of development on the drained Skokie Marsh followed annexation. The building boom in west Wilmette only lasted until the stock market crash in 1929, but Skokie Highway was constructed during the 1930s. The 1930s also included two significant Works Progress Administration (WPA) projects for the village. First, work crews relaid the brick streets, a project which helped preserve the character of the eastern part of town. WPA markers can still be found set in the paving at several intersections. The other notable project was the construction of an open-air amphitheater in Gillson Park, later named Wallace Bowl. By 1940, the population of the Village had reached 17,226. 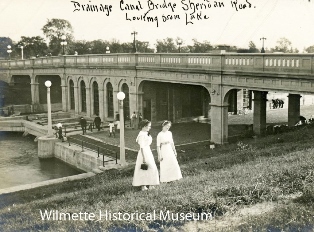 In 1942, Wilmette's boundaries were further expanded when No Man's Land, the triangle of land near the lake and bordering Kenilworth, was annexed after years of legal and legislative battles. Zoning changes allowed high-rise apartment buildings to be built there beginning in the 1960s. Spanish Court was extensively remodeled in 1967 to become Plaza del Lago Shopping Center. The changes in No Man's Land altered the character of the lakefront and brought in new retail and multi-family housing to Wilmette. The Edens Expressway opened in 1951 and the postwar baby boom brought rapid change to west Wilmette. Farmland disappeared as new streets, homes and parks sprang up. The Edens Plaza Shopping Center was opened in 1956. Improvements to the highways made it more convenient to drive to the city, bringing about the demise of the North Shore Line in 1955 and the Skokie Valley Line in 1962. In 1953, a prominent Wilmette landmark, the Baha'i House of Worship, was completed forty years after its construction began. While village services and infrastructure in the 1970s and 1980s were satisfactory, business districts were in need of revitalization. The Comprehensive Plan of 1986 addressed theses problems and established guidelines for land use and the appearance of commercial development. With the improvement of the economy in the 1990s, Wilmette saw renewed interest in both its residential and commercial neighborhoods. The village struggled to find ways to balance its maturity as a suburb with growth and adaptation. The middle 1990s to the present have witnessed a redevelopment of the housing stock, with homeowners and developers tearing down or adding to older homes and creating newer, larger structures in their place. Commercial and multi-family infill has also been common, often accompanied by controversy. Balancing the history of the village with the changing demands of a successful community should prove to be a difficult challenge, truly worthy of the talents of Wilmette's residents. Adapted from Wilmette Preservation, 1999 edition.